To kick off KMW's two-week series, Better Know a Bonnaroo Band, we're going to take a look at Knoxville's own hometown hip-hop hero, LiL iFFy. Alliteration aside-- (Excuse me. Did it again.) Alliteration *notwithstanding, iFFy and his Wandcore crew will be the next Knoxville act that will have the opportunity to rep their city on a grand stage, and it doesn't get much grander than Bonnaroo. iFFy and his producer, DJ Tom Ato, are trending upward right now and quickly. In the last month alone, in addition to making it on the Bonnaroo lineup, they've announced a new album, been voted Knoxville's Best Hip-Hop by Metro Pulse, picked up some press from No Country For New Nashville, and even got a dis track from a lesser known rapper. The latter, to me, is the most telling of any rapper's level of success. The Knoxvillian wizard clique will take the stage on Sunday, and they come highly recommended. Rap is a tricky genre to do well in a live performance. More than most, LiL iFFy understands the entertainment aspect of putting on a good hip-hop show. He knows how to werk a crowd. Audience participation, movement and stage presence, lights, props, hype men who can also spit a verse or two, and anything else to theatrically tell the story are to be expected at an iFFy show. "Werkin" is a one-off single to tide the fans over before the release of their next full-length album, Wand Out. Lyrically, it's a complete overhaul of the style that LiL iFFy has become known for shedding any semblance of a wizard theme or Harry Potter references. iFFy shows the same distinct voice and complex flows that his listeners have grown accustomed to but also stepped out of his wheelhouse to show that he can be clever on topics other than Harry Potter. That's a smart move too, because while Harry Potter lines are abundant and something he can always go back to, they are finite. Musically it's a change as well. Again, no complaints here. Ato trades in the dark, acid-electro beats that follows the theme of the dark arts for a more upbeat, instrumental, funk-laden track with horn-section hits. I am in awe of Tom Ato. The more this guy puts out, the more you begin to sense that his talent knows no bounds. "Werkin" is nearly a 180 from most of his past work, and he completely nails it on his first try. 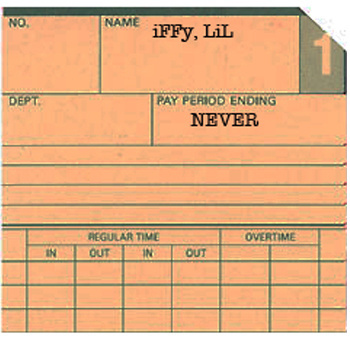 If you haven't yet, I recommend checking out LiL iFFy's Bandcamp where you can listen to and download everything he's put out so far. Equally important, if you're heading to Bonnaroo, find your way to his show on Sunday. And if you miss that, he'll be performing in Knoxville at The Pilot Light on July 26th.